February 17th, a big night celebrated at the Big Zone. Born in Switzerland but raised in Chile, the Cadenza and Basaec boss, the founder of One Coin for Life charity, is one of today’s most influential and best supported headline DJs in the world, backed by residencies such as Vagabundos at Pacha and Ushuaia in Ibiza. 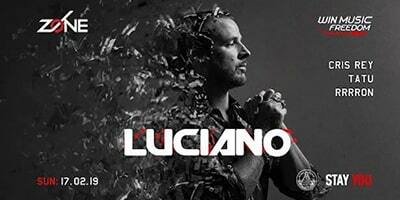 On Sunday, February 17, as a gift to the music scene for the 11th Anniversary of the Independence of Kosovo, Zone Electronic Series presents Luciano. The lovely Cris Rey together with local resident rrrron and the legendary Tatu from Tirana will accompany Luciano on an amazing Sunday full of music. Join us in celebration, and in return witness a legendary figure gracing the Zone Club booth in a style never seen before in our city.